Chartographer who flourished at Majorca and Barcelona at the end of the fourteenth century. Prince Juan of Aragon sent to Charles VI. of France in 1381, when the latter was a lad of thirteen years, a "mappa mundi" made by Cresques lo Juheu (see plate under Chartography); it has been suggested that this is the well-known Catalan map now in the Louvre, which marks an epoch in the history of map-making, as the recent discoveries of Marco Polo were added to the usual information contained in the "portulani"or sea-charts of the Mediterranean mariners. (See Chartography.) In 1390 Cresques obtained no less a sum than 60 livres and 8 sous for a map made by him for Don Juan, King of Aragon. 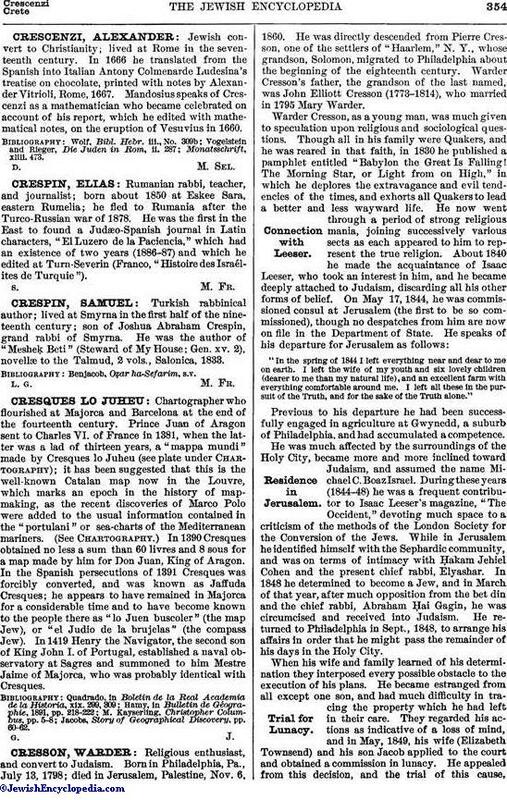 In the Spanish persecutions of 1391 Cresques was forcibly converted, and was known as Jaffuda Cresques; he appears to have remained in Majorca for a considerable time and to have become known to the people there as "lo Juen buscoler" (the map Jew), or "el Judio de la brujelas" (the compass Jew). In 1419 Henry the Navigator, the second son of King John I. of Portugal, established a naval observatory at Sagres and summoned to him Mestre Jaime of Majorca, who was probably identical with Cresques. Jacobs, Story of Geographical Discovery, pp. 60-62.